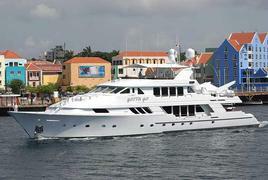 A word with Kevin Callahan at Moran Yacht & Ship confirms that he's signed the 42.3m motor yacht Gotta Go for sale. Gotta Go was built in composite by the Christensen yard in 1995. Bureau Veritas classed, this superyacht accommodates 10 guests in a main deck full beam master suite and four double staterooms below and has a cruising speed of 15 knots and a range of 3,000 nautical miles. Other features include an on board gymnasium and a Jacuzzi on the large top deck. Currently lying in Palm Beach, Gotta Go is asking $6.95 million.